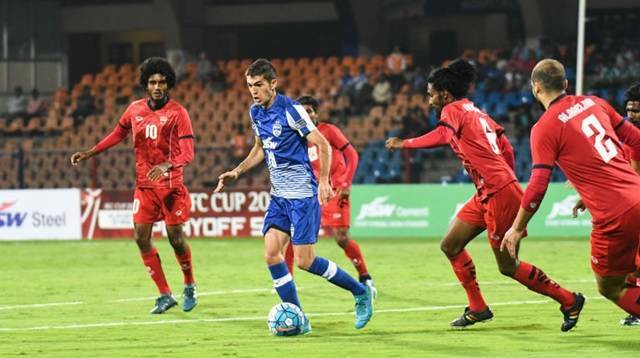 Antonio Rodríguez Dovale hattrick powered Bengaluru FC into the Group stages of the AFC Cup as they beat TS Sports Club 5-0 at the Kanteerava Stadium on Tuesday. The first leg in the Maldives was a closely fought game as Bengaluru managed to steal a 3-2 away win.Bengaluru FC was on an offensive from the start at their “fortress” as they marauded TS Sports Club with an early goal in the 12th minute through a powerful long-range effort by Dovale from an Alwyn George assist. Dovale was at the heart of the action as he found himself in a scoring position on the 35th minute as Paartalu headed the ball into the box towards Dovale and Spaniard made no mistake to rattle the nets once again to extend the lead to 2-0 with a neat finish. Bengaluru FC was on a roll as they dominated the possession and within a minute Erik Paartalu’s clever volley from 40-yards out caught the goalkeeper off the line to give Bengaluru FC 3-0 lead as TS Sports went into the break with three goals down. In the second half, three minutes into the game Udanta Singh in a quick counter-attack made the run laid it off for Toni Dovale as he just slotted the ball with a simple finish to complete his hattrick for the night. Rahul Bheke increased the woes of the Male side with a goal on 90th minute to give Bengaluru a comprehensive 5-0 win and an aggregate 8-2 win to seal a place in the AFC Cup Group stages where they join Aizawl FC(India), New Radiant (Maldives) and Abahani Limited Dhaka(Bangladesh) in the group E.